Come join the VeggieTales gang in fun and adventure in VeggieTown. 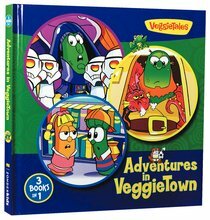 This three-book collection of stories from the VeggieTown Values series provides children with an ideal gift they will enjoy for years to come. About "Adventures in Veggietown (Veggie Tales (Veggietales) Series)"
This devotional gives girls a fun, meaningful way to think about God every day. Perfect for bedtime reading, family devotion time, or as a fresh way to start the day! Ages 4-7. This jumbo-sized, shaped VeggieTales board book teaches children 6 and under that God thinks they are unique and special and that they are very important to Him - just as He made them!